Marisol is named for Venezuelan-American artist Marisol (1930–2016), a star of the New York art scene and friend of Andy Warhol. Marisol’s iconoclasm and glamour, combined with her international outlook, make her a fitting inspiration for the MCA’s new restaurant. Marisol’s gift of the sculpture Six Women in 1968 started the MCA’s collection. As a nod to our namesake, some of the items featured on the menu are inspired by the artist’s favorite dishes. Marisol with Six Women, 1965–66. Marisol can be your neighborhood coffee spot, or an art-filled destination for dinner and drinks. 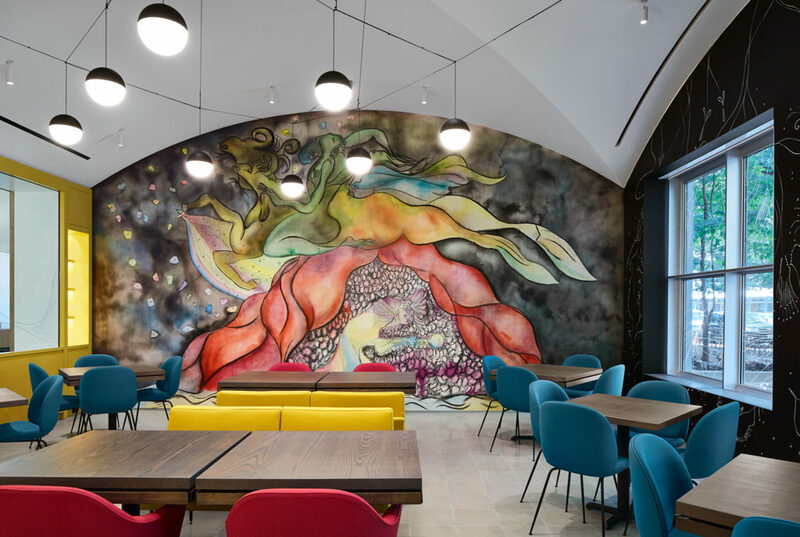 Surrounded by an immersive art environment by artist Chris Ofili, diners enjoy table service with a full bar and private dining space, or counter service with communal tables. Marisol private dining room. Photo: Kendall McCaugherty, © Hall+Merrick. The MCA commissioned British artist Chris Ofili to design an immersive art environment for Marisol. The centerpiece of this permanent commission is a vibrant wall painting in the private dining room that inspired the restaurant’s gem-toned color scheme. Born in Manchester, England, Ofili represented Britain in the 50th Venice Biennale in 2003, and won the prestigious Turner Prize in 1998. His work, which has been exhibited and collected internationally, draws on a wide range of sources including jazz and hip-hop, poetry, and the Bible. As part of the renovation of the MCA’s public spaces, award-winning architectural firm Johnston Marklee reimagined the interior layout of the museum to include a new restaurant and bar that blur the boundary between the old and new. Johnston Marklee principals Sharon Johnston and Mark Lee were recently named the Artistic Directors of the 2017 Chicago Architecture Biennial. The firm is recognized for collaborations with contemporary artists and chefs; the art and cultural institutions with whom they have worked include the Hammer Museum, Harvard University, University of California, and the Menil Foundation. The creative spirit behind the new restaurant is celebrated Chicagoan Jason Hammel, Executive Chef and owner of award-winning Lula Café in Chicago’s Logan Square. Known for his trailblazing seasonal cuisine, Hammel made Lula Café a pioneer of the farm-to-table movement. He was one of the first chefs to source local, organic ingredients and build close relationships with Midwestern farmers, emphasizing freshness and seasonality and adding creative new dishes every week. Marisol gift cards make gift giving easy! Treat your friends and family to a culinary adventure in Marisol’s immersive interior. Marisol’s inventive, fleeting menu from the chefs behind Lula Cafe lives up to its locale inside Chicago’s modern art museum.